The Inter Agency Workgroup which was formed to provide a consensus statement to inform Medicare coverage of lower limb prostheses has been published. As part of the consensus statement, the Inter Agency Workgroup recommended, and CMS concurred, that the draft LCD and Policy Article for Lower Limb Prostheses, that was initially released on July 16, 2015, should be removed from the DME MAC websites and that the current LCD and Policy Article should remain in force for the immediate future. On June 21, 2018, the DME MACs released a joint publication announcing the retirement of both the draft LCD and Policy Article. The announcement of the draft LCD and Policy Article may be viewed by clicking here. On December 1, 2016 the Agency for Healthcare Research and Quality (AHRQ) announced that it was soliciting public comment on the key questions that would be used in its previously announced systematic review of clinical literature relative to lower limb prostheses. Comments were to be submitted no later than 11:59 pm on December 20, 2016. AOPA, with significant input from its Medical Advisory Board and its expert steering committee, as well as AOPA Board members, developed and submitted detailed comments that addressed both the systematic review in general as well as responses to the 8 key questions on which the AHRQ had requested comments. In addition to its own comments, AOPA actively contributed to comments developed and submitted by the O&P Alliance, and AOPA expressed in our submission to AHRQ that we also join in and support the comments of the O&P Alliance of which AOPA is a member. Many other organizations and individuals have also submitted comments on this very important topic. While the announcement does not tie the systematic review to the work of the inter-agency taskforce assigned to review the delayed draft Local Coverage Determination (LCD) that was released by the DME MACs in the summer of 2015, it is clear that the initiation of the systematic review for lower limb prostheses is directly related to the work of this taskforce. AOPA will be requesting a meeting with representatives of the AHRQ in order to discuss existing systematic reviews for lower limb prostheses that have recently been completed through AOPA funding as well as the previous and current cost effectiveness studies that have been developed by Dobson DaVanzo. In addition, AOPA will discuss the ongoing work of the RAND Corporation to determine the cost effectiveness of prosthetic intervention. In June 2016, as a result of the series of meetings during the Policy Forum involving Senator Kerrey and top members of the Senate and the Finance Committee, and particularly through AOPA Past President Tom Watson’s intercession with Senate Majority Leader McConnell, important language was inserted into the Committee report which has been prepared to explain the 2017 Senate Labor/HHS Appropriations Bill. This is an important directive to CMS, essentially that in light of reductions in Medicare prosthetic spend over 2012-2014, there seems no necessity for intervention to change the LCD, and instructing CMS to consult with clinicians, patients and prosthetist groups before releasing any new or revised version of the LCD. On April 21, 2016, AOPA held a press conference call to discuss the impact that CMS’ proposed Lower Limb LCD is having in the private sector. Media participants heard from AOPA President Elect Michael Oros, CPO, FAAOP and two amputees who have been affected by the new policies. Listen to the audio from the call and the press release summarizing the call. On April 25, Rep. Renee Ellmers (R-NC) and Rep. Jan Schakowsky (D-IL) introduced H.R. 5045, a bill that would establish a moratorium on any action on the LCD through Spring 2017 and remove the withdrawn LCD from the CMS and DME MAC websites and establishing that, contrary to some legal interpretations at HHS, CMS indeed can, and is obliged to manage and instruct its contractors, including the DME MACs, what to do across topics including LCD issues. The next day (April 26, 2016), the first fruits of a months-long effort spearheaded by AOPA appeared as the House Oversight and Government Reform Committee released a letter it has initiated to HHS Secretary Sylvia Mathews Burwell, criticizing the prosthetic LCD efforts of CMS and its contractors, and launching an oversight inquiry with a request for a substantial collection of documents. HHS issued a noncommittal response, reiterating its decision to convene an Interagency Work group to develop a consensus statement. AOPA is pursuing a two part strategy: (a) AOPA partnered with a congressional representative in UHC’s state, who contacted UHC requesting that they set up a high level meeting with AOPA reps; and (b) AOPA has joined in a letter of objection to the policy from the O&P Alliance, together with the Amputee Coalition, challenging the assertion that there is no scientific evidence to support this treatment, and seeking a meeting with UHC’s Medical Director. We believe the results can be additive and symbiotic, not divisive, in bringing attention to the problem from multiple directions. Read UHC’s disappointing response and then the O&P Alliance’s rebuttal. Cigna has taken the same action. See the letter from the O&P Alliance and the Amputee Coalition to Cigna. We promise to continue to keep you posted on the UHC issues, but we have also received an early indication about another mischievous outgrowth of the commercial sector jumping on the draft LCD as an opportunity for cutbacks–this time from one of the state BCBS plans. We are waiting to see documentation, but if this proves correct, we will again communicate with the insurer AND communicate to CMS (as we did when the UHC policy first arose) underscoring yet again the need for a quick decision to rescind the draft LCD. Read this news article about the issue. WITHIN A MATTER OF DAYS of the July 16, 2015 draft policy issued by the DME MACs, AOPA mobilized its members, allies, and advisers to work on multiple strategies to have this ill-conceived policy rescinded. The O&P Community, the amputee community and the leadership of the groups that represent them, quickly banded together in a coordinated effort to make sure our O&P voices were heard. AOPA created an action plan to guide our overall strategy. On November 2, 2015, the White House issued a statement that the proposal would not be finalized. (Read the initial petition here.) CMS would be convening a workgroup of clinicians, researchers, and policy specialists. The immediate concern is that this is NOT a rescission of the Draft LCD. Some might see this as following a too frequent government step of “kicking the can down the road.” AOPA’s leadership and regulatory specialists will review ALL government and contractor communications as they arise, and provide a further analysis once that in-depth review is complete. Read AOPA’s full statement on the White House announcement. 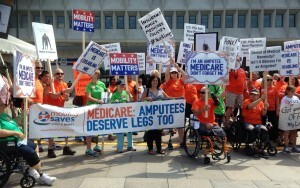 Read the CMS statement, and the DMEMAC statements – Jurisdiction A, Jurisdiction B, Jurisdiction C, Jurisdiction D.
For the first time ever, AOPA organized a patient rally of more than 150 amputees at the U.S. Department of Health and Human Services (HHS) headquarters. AOPA arranged for buses from DME MAC hearing to the rally in front of the HHS building. Amputees and non-amputees joined together and made sure their voices were heard for almost 3 hours as they marched, rallied, gave speeches, and literally stood on a soap box to deliver the message to CMS that artificial limbs are not a luxury. AOPA submitted 43 pages of comments on the draft policy. AOPA provided prewritten comments on AOPAVotes.org and mailed patient postcards to members. This generated over 5,070 comments from patients, practitioners and other O&P professionals, which have been included in the official record for the LCD rule making. AOPA arranged for five speakers at the August 26th DME MAC public meeting in Linthicum, including AOPA President Charlie Dankmeyer, CPO, AOPA Past President Tom Watson, CP, AOPA President-elect Jim Campbell, PhD, CO, AOPA Executive Director Tom Fise and Boston Marathon Amputee Adrianne Haslet. On August 26th, at the end of the HHS rally, responding to an August 25th request from AOPA to meet with HHS Secretary Burwell, representatives from AOPA, the O&P Alliance, and the Amputee Coalition met with CMS Acting Administrator Andrew Slavitt as well as other high ranking CMS and HHS officials to reiterate the concerns of the O&P community regarding the potential impact of the draft LCD and Policy Article. Reports from this meeting indicate that it was extremely positive and that CMS will be discussing the draft LCD and Policy Article further with its DME MAC contractors. On August 11, AOPA, along with other industry leaders, met with the Deputy Director of CMS, Sean Cavanaugh, to discuss the DME MAC’s draft LCD Lower Extremity Prosthetics and Policy Article. We challenged the dearth of scientific support for the policy and reiterated the O&P Alliance request for rescission of the policy. We pledged to work in earnest with CMS, the DME MACs and other stakeholders, starting with a demonstration project through the CMS Center for Innovation that would update coding, be both evidence-based and value-based, and benefit patients—all of the things that this draft proposal is not. AOPA invested time and money to capture the current state of Medicare payments for prosthetics. 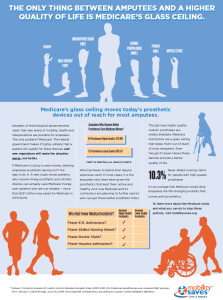 Data analysis shows that Medicare prosthetic costs are DOWN 13.8% in past 4 years. The 2005-2010 data used by CMS contractors to support their proposed policy was based on outdated information. AOPA submitted a Freedom of Information Act Request to determine the scientific basis for the proposed policy. The response from the DME MACs included a 31 item bibliography which is woefully weak in providing any scientific evidence to support the proposed changes. Some of the authors cited in the bibliography acknowledged their work cited by the DME MACs does not provide any support for proposed changes. AOPA sought collaboration which resulted in a group letter from three past presidents of the American Academy of Orthopedic Surgeons, physicians from the University of Iowa, plus communications from a President of the Association of Bone & Joint Surgeons, the American Orthopaedic Foot and Ankle Society, and the International Federation of Foot and Ankle Societies—all opposing the proposed policy changes. Read the comments submitted by the VA to the Medical Directors. AOPA’s www.mobilitysaves.org is a resource for practitioners, other caregivers, insurance professionals and consumers for communicating how timely appropriate O&P care reduces long-term costs. Valuable information such as patient vignettes, the PR campaign, and amputee talking points were posted to communicate information on this specific proposed policy. Also featured is a remarkable letter authored by amputee and former U.S. Senator Bob Kerrey explaining to HHS Secretary Burwell how detrimental implementation of this policy would be for himself and other amputees. AOPA developed print and television advertising campaigns using the concept of “The Prosthetic Glass Ceiling” to illustrate how an amputee patients can “see” new, improved prosthetic limbs, and advanced technologies that improve mobility, independence and quality of life, but are often denied these new enhanced prosthetic limbs. The print message ran in The Washington Post and The Hill, and the video ran on This Week with George Stephanopoulos and several other Sunday news programs in Washington, DC. Members can visit MobilitySaves.org to access the AOPA TV/broadcast “Glass Ceiling” message and post it on social media. You can spread the word by providing a link to the Mobility Saves page where both of these messages are displayed. AOPA generated a series of Patient Vignettes in cooperation with the Amputee Coalition that communicate the personal impact of the proposed LCD on patient care, eligibility for advanced prosthetics and overall patient welfare. A joint AOPA/Amputee Coalition teleconference Press Conference was held August 25 to alert the media about the August 26th hearing and patient rally at HHS. Over 350 news stories about how amputees and prosthetic businesses could be impacted by this policy have been generated by all of these efforts. A “We the People” petition to the White House was started by NAAOP President (and AOPA Board Member) Dave McGill which achieved its 100,000+ signatures mark in just 17 days. The White House promises response to any petition which includes 100,000 signatures. After the initial media buzz of more than 350 press articles on the HHS rally and LCD Proposal, the media is still picking up on the issue in a big way: On September 20, The Wall Street Journal published an article on the issue.